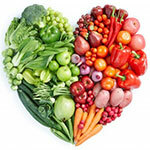 THURSDAY, May 8, 2014 (HealthDay News) -- Regularly eating fruits and vegetables may reduce your stroke risk, according to a new review of worldwide research. Stroke risk declined by 32 percent for every 200 grams of fruit consumed each day, and by 11 percent for every 200 grams of daily vegetables, according to the findings published in the journal Stroke. "Improving diet and lifestyle is critical for heart and stroke risk reduction in the general population," senior study author Dr. Yan Qu, director of the intensive care unit at Qingdao Municipal Hospital in China, said in a news release provided by the American Heart Association. "In particular, a diet rich in fruits and vegetables is highly recommended because it meets micronutrient and macronutrient and fiber requirements without adding substantially to overall energy requirements," Qu added. Stroke is the fourth leading cause of death in the United States and a major cause of disability. In China, stroke is the leading cause of death. Boosting people's consumption of fruits and vegetables up to 600 grams a day could cut the rate of ischemic stroke (caused by a blood clot) by 19 percent worldwide, according to the World Health Organization. Investigators analyzed 20 studies over the last 19 years that included more than 760,00 people and were conducted in the United States, Asia and Europe. The lower risk was seen in strokes caused by a blood clot (ischemic) or bleeding (hemorrhagic) and was consistent among men and women and people of different ages. Because of the way the study was designed, it can't show that fruits and vegetables are the cause of the decline in strokes, only that there is an association between frequent produce consumption and a lower risk of stroke. Eating plenty of fruits and vegetables has also been linked to lower blood pressure, improved blood vessel function, as well as beneficial effects on body fat, waist size, cholesterol and inflammation, according to the review authors. Adults should eat four to five servings each of fruits and vegetables a day, according to the American Heart Association.